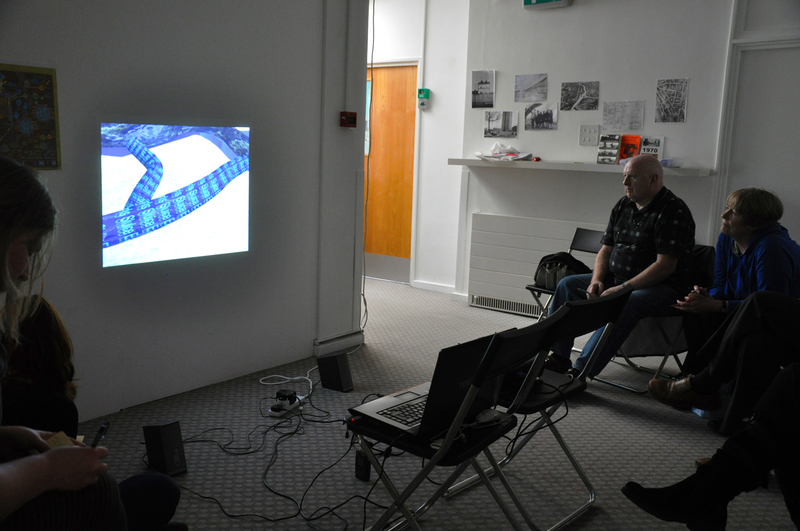 We were joined this week by artist Sandra Crisp who screened her recent video ‘Mapping London’s Subterranean Rivers’, a digital 3D map elevation that reveals the city’s unseen underground and ancient waterways. The group took some time with Sandra to generate our immediate responses to the video, and Sandra also explained her process of analysing her research and data and finding a way to manifest that visually. Sandra’s video can be viewed online here. We then went on to look at various examples of online mapping projects, discussing the kinds of virtual communities that grow around these user-generated data hubs, whether that be people sharing personal memory maps on flickr or the intricately woven politically and socially driven maps and tools created by TheyRule.net and debategraph.org, which encourage co-operative and collaborative user participation on a highly global level. Debategraph.org aims to offer a “powerful way for communities to learn about, think through and decide upon complex issues […] by enabling communities of any size to externalise, visualise, question, and evaluate all of the considerations that any member thinks may be relevant to the topic at hand – and by facilitating intelligent, constructive dialogue within the community around these issues.” We have set up our own debategraph on the website under the title ‘(London) Riots’ working directly from the notes we compiled last week around perceptions of the riots in London (see post on Session 5). Sign up with debategraph for free and join our community if you would like to view or add to this graph. 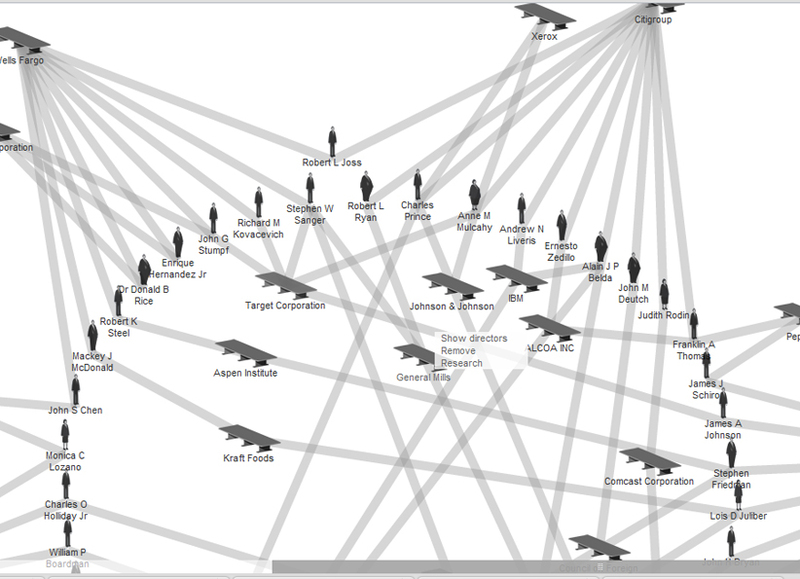 While debategraph.org encourages the development of communities around particular questions and issues, TheyRule has a more overtly political agenda; TheyRule is concerned with mapping some of the relationship of the US ruling class, taking as its focus, the boards of some of the most powerful US companies, showing how many of these boards share the same directors. Some of these individuals sit on up to 7 of the top 1000 companies! It has a very intricate search system allowing you as a user to browse through these interlocking directories and even add your own research if you create a log in to the site. 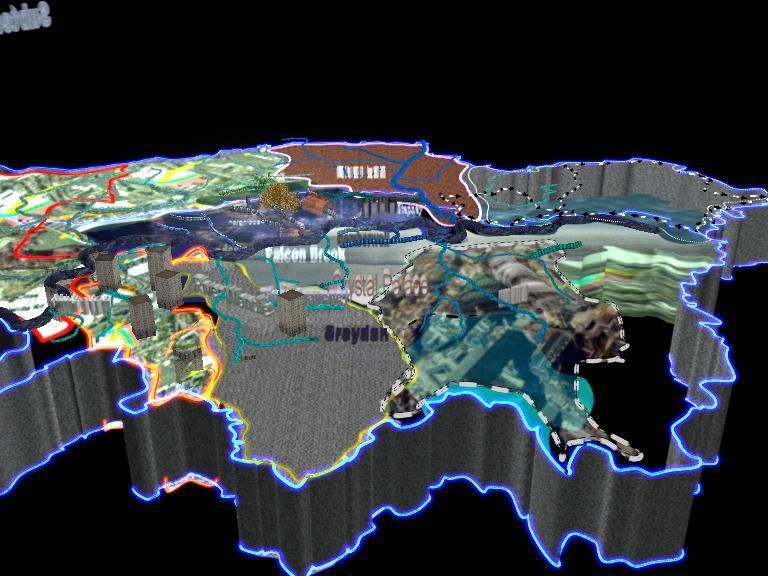 TheyRule is a fantastic example of how mapping can be used as a powerful critical research tool. We returned to many of the questions raised in our first session surrounding map-making itself and counter-mapping – the power inherent in the process of map-making, selection, filtering; who has access to data and how is it distributed; making visible and repressing information. In this context we made a simple comparison between Google Maps and OpenStreetMap (http://wiki.openstreetmap.org/wiki/Google_Map_Maker), the former owned by a gigantic global entity with the power to claim ownership (and profit) over any raw data input by the global community; and the latter an open source tool that allows its users to freely input, reuse, modify and distribute its data, allowing users to inform and improve the system. We finished the session by spending some time together thinking over the research we have gathered so far over the last 6 weeks and plotting some of these points on an online map….. This session was framed around 3 pivotal and radical events in recent history: 1958 Race Riots, community activism related to the building of the Westway and the Frestonia Free state (1977). They all occurred in North Kensington, specifically within a half mile radius of Latymer Projects. We attempted to map social conflict and community activism, questioning how we understand and interpret history. Our discussions also looked at the relevance of these events for today. After viewing the news clips from 1958, we discussed the causes / impacts of the riots. One of our participants recalled how as a young man he was caught up in the hysteria and prejudice against the black community that had recently settled in Notting Hill. Although there is a well documented trigger incident for the 4 days of rioting (an argument between a Swedish woman and her black husband outside Latimer Road station), there were other background factors in play: post-war housing shortage, slum housing in North Kensington and right-wing elements. 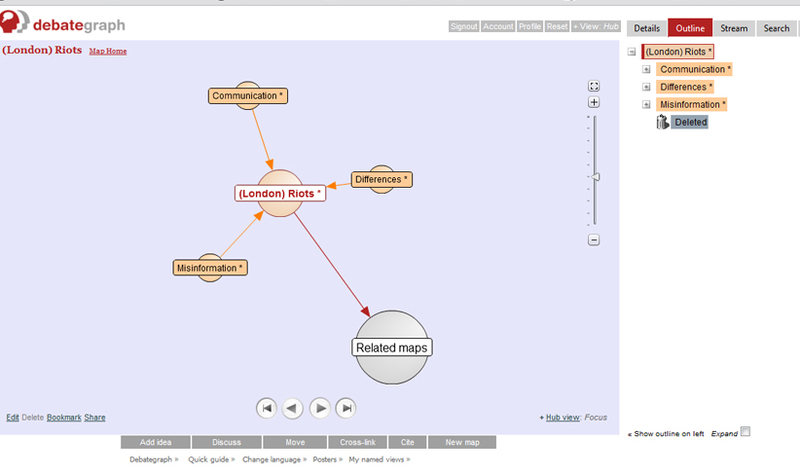 A mapping exercise explored the links / differences between the 1958 and 2011 riots. Although in the planning pipe-line since the 1930s. there was limited community resistance to the Westway being built. Most residents would probably not have been aware of the Western Avenue Extension (as it was then called) until it was about to be built. In the late 1960s, the community focus was more on securing future play and community space under the motorway. Activism became more pronounced in 1970s when the residents of Walmer Road / Acklam Road, whose houses were sited very close to the superstructure, demanded to be rehoused. There was a protest that held up the official opening of the Westway. Squatters began to occupy houses in the Latimer Road / Freston Road area in 1972. In 1977 they had formed the Republic of Frestonia and declared independence from the UK. We listened to an audio recording and slideshow of photographs taken by Tony Sleep. He was a resident of Frestonia at the time and acknowledged how the local working class community regarded them as middle class hippies. This was confirmed by a participant in the session who recalled looking down on the Frestonia crowd. Listening to the audio and seeing Tony’s photos for the first time, he revised his former opinion and acknowledged sympathy. We also had a discussion around how a community group could define itself as indepenent from wider society. The Frestonian’s, for example, produced their own passports, stamps and had their own newspaper and ministers of state. Here is a map of the walk that we made and includes photos taken at the site of the 1958 Race Riot, Frestonia and elevated section of the Westway. Drawing from the ideas of Situationists and psychogeography from our third session, the Latymer Mappers took their maps out into the local area and let themselves be guided by the responses of people we met along our route. Setting off from Latymer Projects we spoke to a mother and daughter outside Frinstead House, the tower block directly across from us. We then found ourselves making for the Westway (naturally), under which there seems to be the most activity in terms of people walking about or making their way to places. We stopped to speak to some graffiti artists adding a new fresco to one of the concrete walls under the Westway. 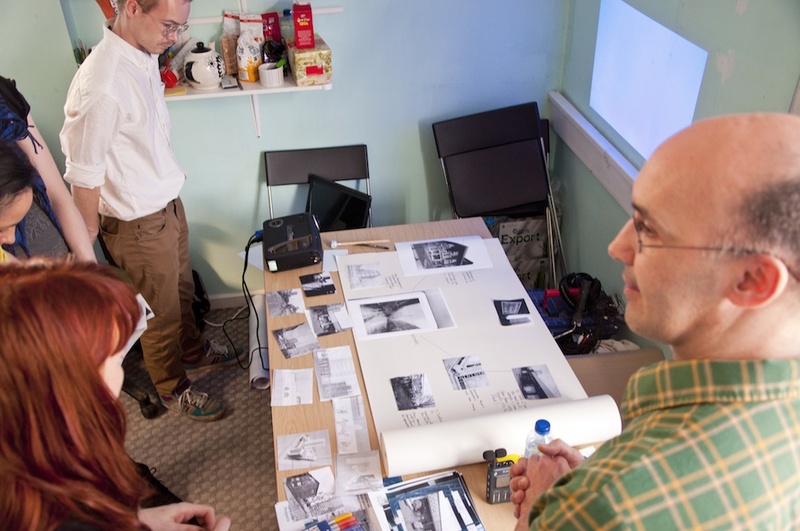 This is one of the few spaces that is legally available to artists, and they travel every couple of months together from their homes in Ealing to work on something new together. Directly under the central structure of the Westway we met a couple coming to the area for the first time to take their daughter horse-riding in a small leisure space under the motorway. A few minutes later we approached a man who burst into a rage about the destruction of trees (particularly the silver birch) and the natural wildlife and then quickly disappeared down the road. We followed in that direction noting the way the Westway violently cuts the original Latimer Road in two, leaving Latimer Road north of the border and the more recent Freston Road in the south. Constantine pointed out the two hooks coming off the central circular structure of the motorway, which were built as part of the original masterplan to expand North. Further up Latimer Road we took a right and on the corner of Highlever Road and Oxford Gardens, we chatted to a man who had lived in the area since he was born there 72 years ago. Tim and his dog Toby were going for one of their 4 daily walks, one of their regular haunts being Wormwood Scrubs, though Tim pointed out sadly that it’s bound to be built on at some point. We walked for a while circling round onto Bramley Road on the way back to Latymer Projects. Many more people hanging about under the Westway as we passed it heading south this time. Someone serving a very optimistic BBQ on one of the small side streets. We spoke to a woman for a while further up Bramley Road, another who had lived in the area since she was born. Our first question for her was “What’s the best thing about this area?” She laughed reluctantly “…er, nothing.” Her frustration at the lack of services and things to do in the area was clear. She explained also that her son has had to attend a school much further out in Fulham as there were no spaces left at the two local schools he applied to. She felt that many places were being given to pupils from outside the area, when they should really be going to the local kids. Coming back onto Shalfleet Drive and turning into our well-treaded footpath to the space, we paused to speculate about the meaning of a new piece of graffiti which seems to have used some of the white paint left lying about by the builders currently making preparations for the planned redevelopment. Once back in the space we took some time to map out our route and the conversations we had, and will start to think about where this will take us next. 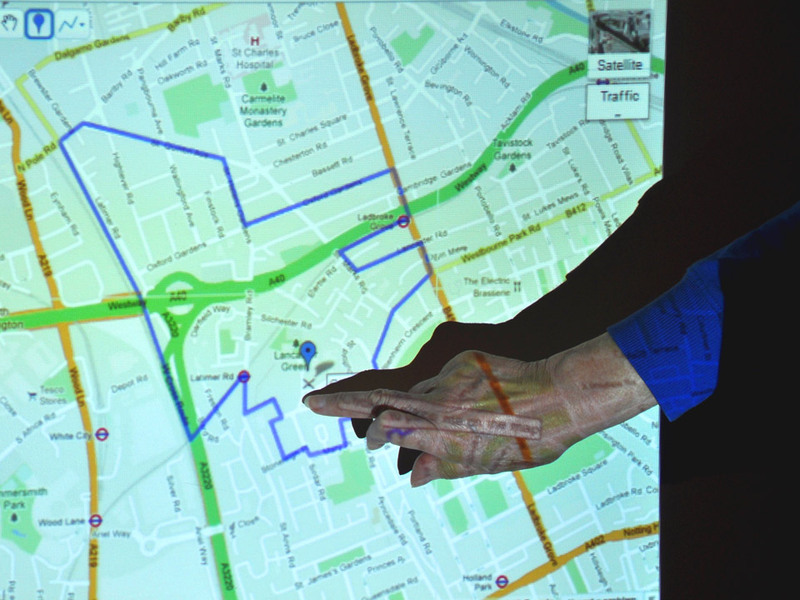 The third session of the Latymer Mapping project welcomed guest speaker Chris Collier, who introduced us the ideas and history of various ideas of using and encountering space differently, such as Derive (or drift), psychogeography and performative space. These practices have been arrived at through a variety of influences, including art movements Situationists International, Lettrists, Dada and Surrealism, Romanticism in the literature and poetry, and cultural figures such as the 19th century Flaneur. the study of the precise laws and specific effects of the geographical environment, consciously organized or not, on the emotions and behavior of individuals. a whole toy box full of playful, inventive strategies for exploring cities…just about anything that takes pedestrians off their predictable paths and jolts them into a new awareness of the urban landscape. During the break, we listened to some ambient recordings of places from the local area, trying to focus on the way sound affects our sense of place and memory. We then tried our hand at a surrealist game, involving the Irrational Embellishment of the City! In 1933 the Paris group of surrealists conducted a series of collective games that involved participants articulating automatic responses to various pre-selected stimuli and in March that year the topic was ‘some possibilities for the irrational embellishment of the city’. The activity was conducted through the technique of ‘psychic automatism’, basically free association, and participants were required to propose how to ‘conserve, displace, modify, transform or suppress’ each of a list of thirty-one Paris monuments. Taking well known London Landmarks, such as Nelson’s Column, Horse Guard’s Parade, The Millenium Dome, and Centre Point, we split into two groups and imagined ways in which these monuments and spaces might be put to use differently. During the London 2012 Olympic Games, the Beach Volleyball competition will take place on the Prime Minister’s doorstep at Horse Guards Parade. In the future, we hope to build on the exercise thinking about Spaces and Landmarks in the Notting Barns area, thinking about how they might be used more “irrationally” or otherwise departing from their intended use. Chris is involved with the University for Strategic Optimism, a group organising around free and open education, a return of politics to the public and the politicisation of space. Their blog can be viewed here: http://universityforstrategicoptimism.wordpress.com/. We also planned ahead for the next session, in which we will be using a situationist sensibility to direct where our walk around the area, asking people we meet questions to determine our course! This week Latymer Projects invited NEOutopia to talk to the group about their research and recent project NEOgate, which takes a critical look at the rhetoric and ideologies used in the languages and processes of regeneration projects today. NEOutopia also helped facilitate the session with Latymer Projects and Constantine Gras. We started with an exercise called ‘the operating table’ to get us thinking about the ways in which first of all a map is constructed through a selection and compiling of various individual elements which are then drawn together and compressed. The exercise also facilitated a discussion about how alternative map-making can trace other trajectories and links between sites (departing from the approach to map-making as a tool to survey land or to help us get from A to B). Taking images of buildings, signs, transport, and shops in the local area we each picked a particular image that we felt a certain connection with or some kind of curiosity and shared with the rest of the group our reasons for selection. Though it was quite difficult to avoid making links between what each image represented for us and in relation to many of the themes we have discussed so far during the project, the exercise encourages a free association of sorts, making both arbitrary and meaningful links between the images. Following this we discussed the potentials of countermapping using examples such as Bill Rankin’s Place-Name Etymology map (http://www.radicalcartography.net/index.html?etymomap). Josie Bowler and Gilbert Richards from NEOutopia then gave us a short overview of the NEOgate project, discussing the various processes involved and the specific situation and history of the Heygate Estate in Elephant & Castle. This opened out into a wider discussion about urban planning, regeneration and the various kinds of communities that are eclipsed, displaced, but also artificially developed and constructed through the process of regeneration. We also discussed those communities that develop and are crystallised in response and resistance to urban development. Josie Bowler and Gilbert Richards are members of NEOutopia and recently completed an MA in Contemporary Art Theory at Goldsmiths. They recently completed a residency at the Centre for Creative Collaborations and will also be featured in the architecture quarterly City Journal later this Spring. 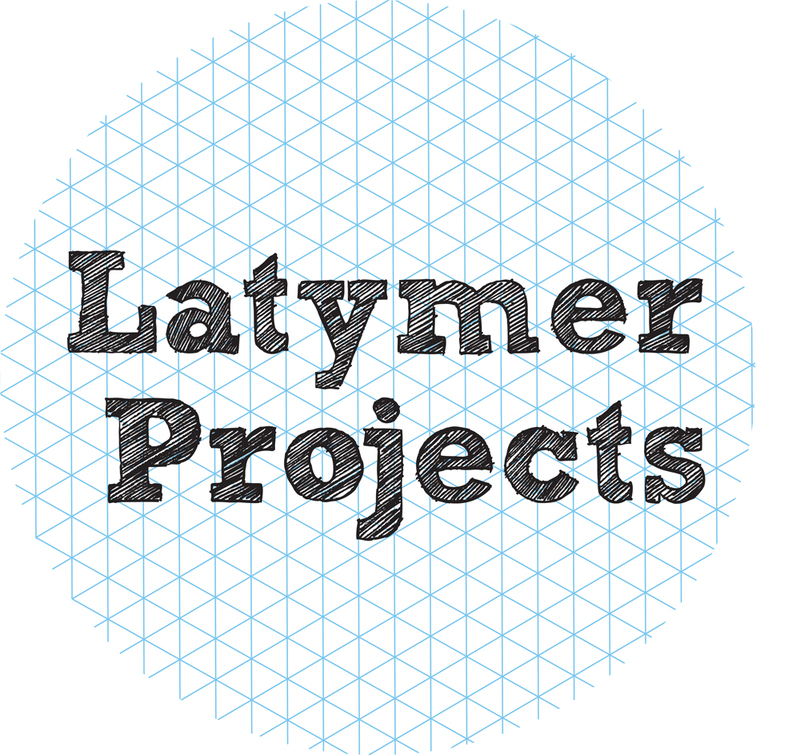 Latymer Projects and Constantine Gras will be holding a 6 week community mapping project and invite local residents to attend. Our first session took place on 17th March 2012. The project was introduced by Emily Ballard and Natalie Marr. 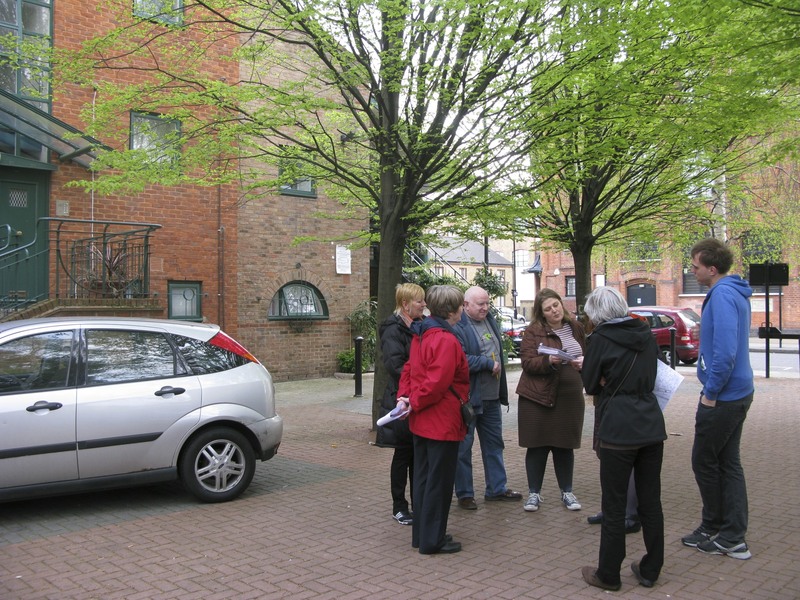 The aim is to create a community map of the local area that reveals hidden relations, engages the community and changes the way the area is thought about. We want to pool together local knowledge and collaborate in mapping an alternative map that that is both radical and playful. How we do this will be shaped by the participants and local residents. Maps will be both digital and analogue. Themes that we are interested in exploring include regeneration and community. This has a particular resonance as the location where we are based, 154 Freston Road, used to be an RBKC Day Care Centre and is about to be demolished as part of a wider regeneration of the Silchester Estate. A slide show by Constantine Gras illustrated the social changes to North Kensington since the 18th century and how these have been mapped by authorities, planners, cartographers, community groups and artists. This part of Kensington has had a unique and radical history that has been shaped by the construction of major transport systems: the Grand Union Canal (1801), railway line out of Paddington (1840’s) and the Westway (1970). Also related to this is the issue of historical and contemporary social problems: overcrowding, lack of or poor housing, relative poverty and health inequalities. In 1958, the area was the site for one of the first race riots in England. • Notting Barns Farm first shown on the 1740’s map of London by John Rocque. This is a completely rural and undeveloped part on the outskirts of the city of London. • Identity of local area first systematically mapped in 1820 with Parish map of Kensington, that has palace and church as its centre. The Grand Union Canal was an important development in 1801 and heralding urbanization of area. • 1841 map of the area showing the Hippodrome race course. This is an early documented account of local resistance to a development in the area. The hippodrome blocked footpaths in the area and local people tore down fences. • Charles Booths Poverty map of 1890s. The area is now built up with tenement housing and defined as either poor or comfortable. Poor is defined as 18-21 shillings a week for a moderate family. This is an important map attempting to illustrate hidden poverty in London and paved the way for social welfare benefits. • London County Council slum Clearance programme map for Latimer Road (1957). Several participants were interested to discover about this information in the London Metropolitan Archive and will undertake their own research. • Pam McDonald map of the Walmer Road Area, This is a memory map of 1930s/40s and shows how families lived in the same area for generations. There is a strong community feel. • Discussion about “community”. One local resident talked about the lack of community today as opposed to the recent past. Difficulty in modern society for people to interact, engage and communicate on a deep level. Children growing up now unaware of the history of the area. Need to communicate this. • Participants were interested to learn about 1930s plans to build the Western Avenue Extension at a route that would be further south. Personal relief that this never happened as it probably would have meant that two local residents might not have met and got married. • Motorway Development Trust map (1968) of how to use the space under the motor way for the benefit of the local community. Successful example of community activism that in the long-term shaped development and regeneration of the area. • Map of the Free Independent Republic of Frestonia (1977) sparked debate. An innovative use of space / community when squatters moved into derelict property destined for slum clearance during the 1970s? Or was this an “alternative community” that held up regeneration of the area? 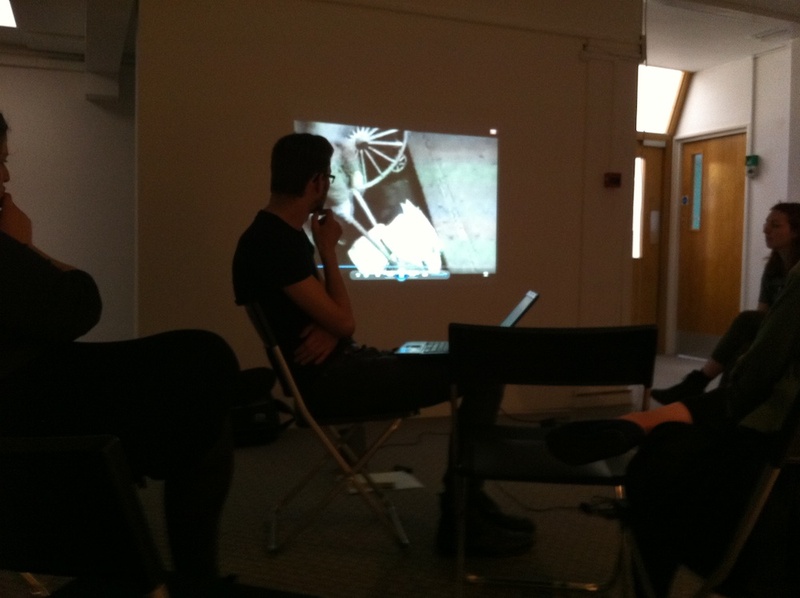 • The current Silchester Garages and Estate Regeneration was discussed and the concept of “urban villages”.